Hello sweetest friends and welcome to our home today! 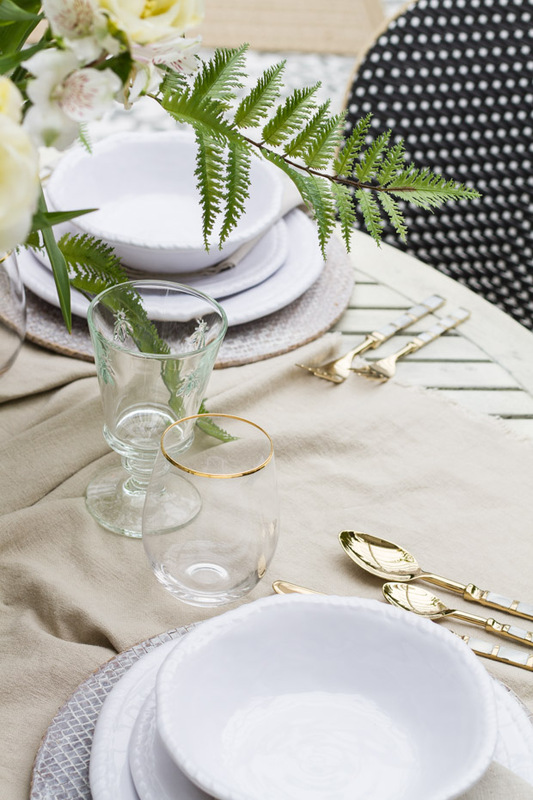 I am so happy to have you here, and honestly as I put this post together tonight I was feeling a bit sentimental… I have partnered with Grandin Road for this patio reveal and I am very humbled to share it with you. So without further ado, thank you for letting me show you this exciting space! As you saw in the first photos you walk out from our laundry room/garage to this patio. I stenciled the concrete floor last year (here) so that it would look like cement tile. In addition, we have an open backyard with mature greenery, it is one of the reasons we bought this home nearly ten years ago and remains one of our favorite features to this day. Which is why we love spending time outside. The funny thing is, it has taken us all these years to really start doing anything with our outdoor spaces and gardens. This space sat unfinished and messy for a long time. Mostly it was for barbecues and sitting occasionally to enjoy those yummy meals. This winter the hubby and I decided that we would cover the patio so that it could be used more throughout the year as we get lots of wet weather where we live. Even in the last month that has clearly been one of the best decisions we have made for our house. Using every square inch of your homes is pertinent. (Side Note: We took a couple inches off the legs of this table so the height was more appropriate for the bench seating). It is a long narrow patio that sits down low and I have always envisioned it be a place to both lounge and dine. Much like the inside of our homes I think it is ideal to have places to eat and to visit (when possible). So I picked a round dining table, bistro chairs and sectional seating (that serves as a bench or booth). Choosing this formation allowed a compact set up or almost a banquet styled area. It is really comfortable with the cushioned seats and all 4 of us fit around it perfectly! 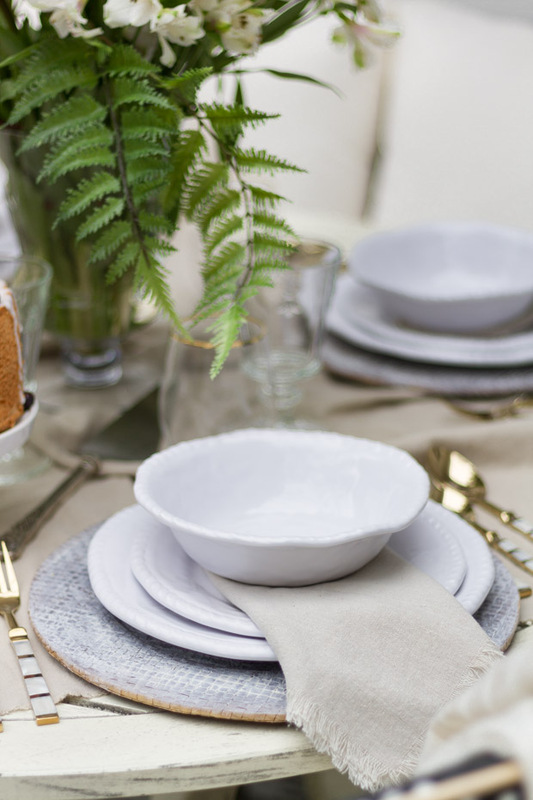 I laid out a simple garden style table setting using these Melamine dishes and beautiful flatware. Gold is a pretty contrast to all the greenery around. 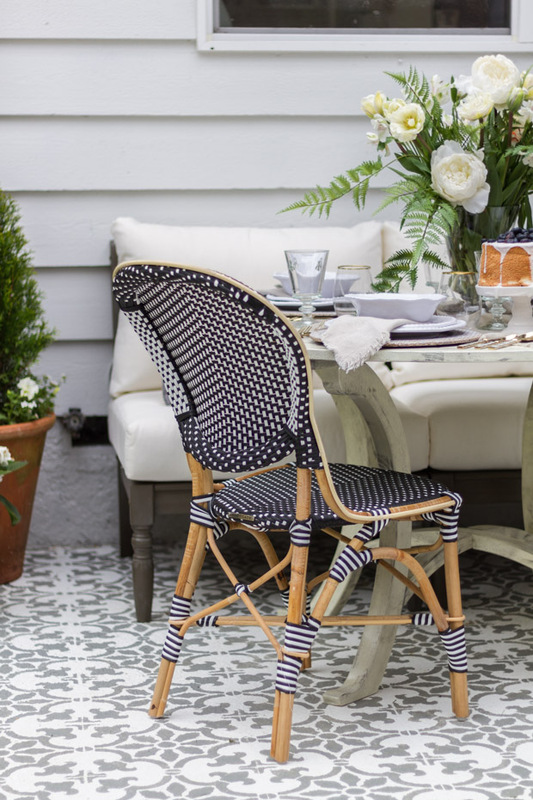 I really wanted the pop of black accents throughout – you will see them in the varying pillows and again these beautifully made bistro chairs. As I mentioned, these dishes are melamine – for outdoor use servingware can still look nice without the worry of little hands accidentally dropping them on the concrete ;)… They appear and feel like the real thing, I was surprised as I pulled them out of the box! 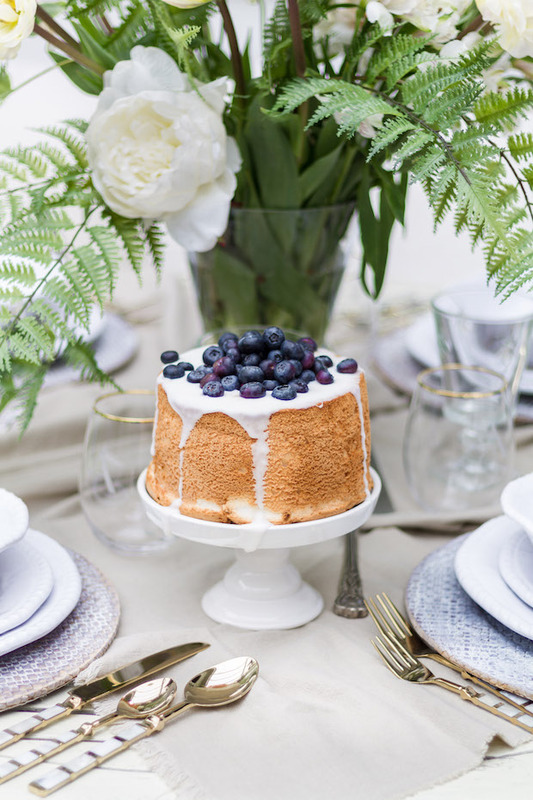 Berries adorn simple angel food cake and make the scene a little more sweet! I love to line the patio with additional greenery and pots. Things are about to bloom like crazy here, but until they do the potted florals and ferns make it look a step ahead. 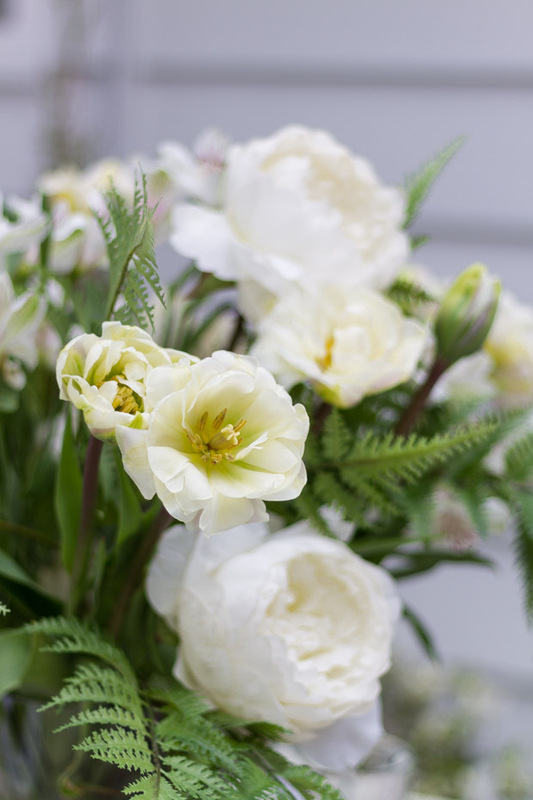 Flowers anywhere, whether in a pot or on a table are fitting for any style of occasion and I couldn’t resist a big bouquet for today. As you sit here on the cushions, you will look across to the other side of our patio as it stretches out. The two spaces are far enough from each other, but allow conversations and visiting to be contained in this quaint area. Again, I fill corners with ferns seen here and would you believe this one is faux?! It is nice and large and doesn’t need care – my kind of plant, haha. This side table provides extra seating or a place for drinks and all these geometric lanterns give off that nice ambience that feels inviting. Whether we are entertaining or just hanging out on our own here, this set up provides so many options for either. This grand fire pit serves both as a fire pit and a coffee table/with tray. I see many fruit trays and fun dishes finding their way out here in the future! 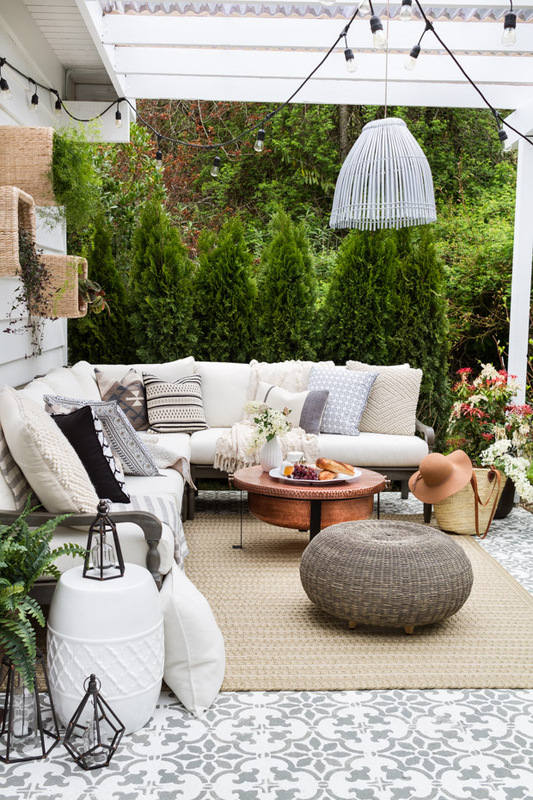 The wicker ottoman is a great spot for feet or another spot to sit and visit. 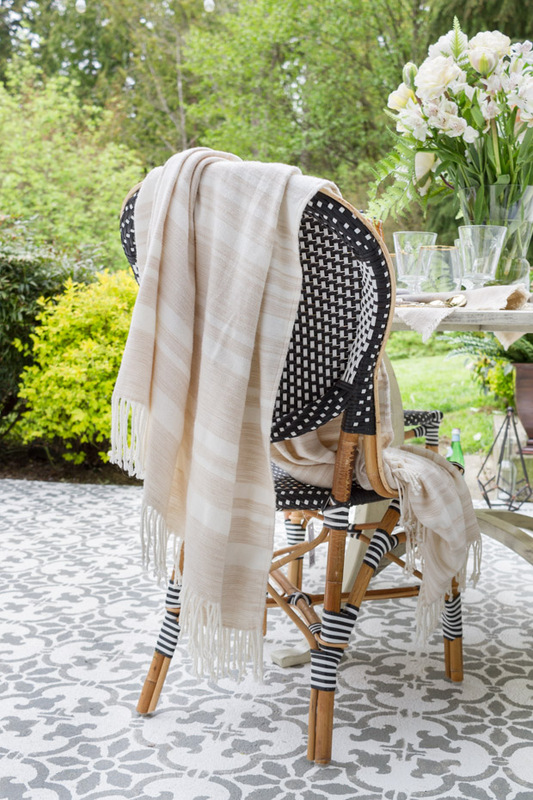 It is fantastic when you can find pieces that can be enjoyed outside for the warmer months and then pulled in during the winter and used inside as well! It’s just another way to get the most of your money with versatile pieces. I did mix in some indoor and outdoor pillows. I wouldn’t recommend doing this if your space isn’t covered, but since we have shelter out there I knew pillows could mingle without getting damaged. 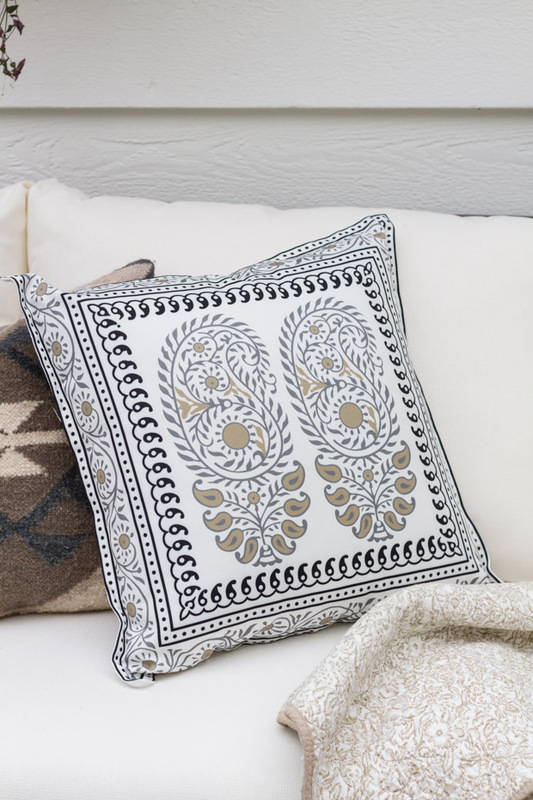 Using reversible pillows and mixing those patterns gives interest to any space! Blankets, hats and more are a necessity even when decorating outside. As they look wonderful, but they serve an important purpose in comfort. 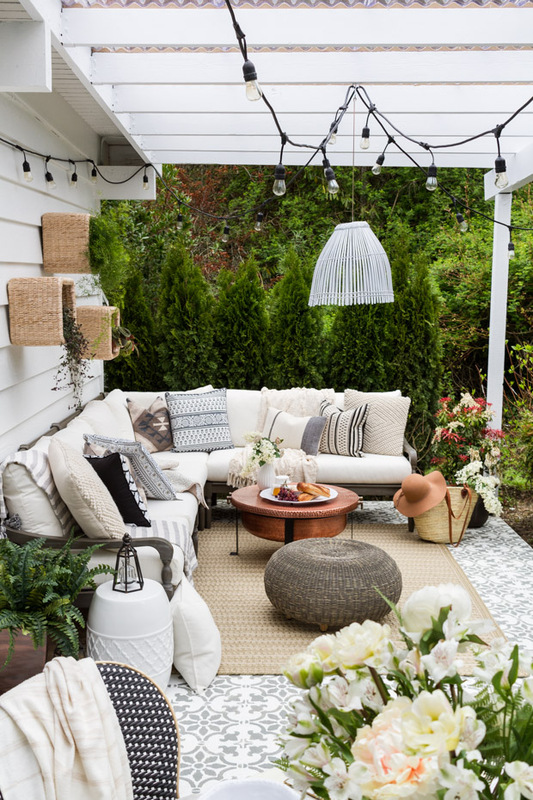 Even though this was an outdoor space, I wanted it to be cozy. We brought in this rug and it is so soft to walk on. It will make bare foot afternoons that much easier and enjoyable. I hung these wicker shelves for this same reason, while a space is outside it doesn’t have to feel empty. Adding greenery and shelving warms the area and makes it feel alive. 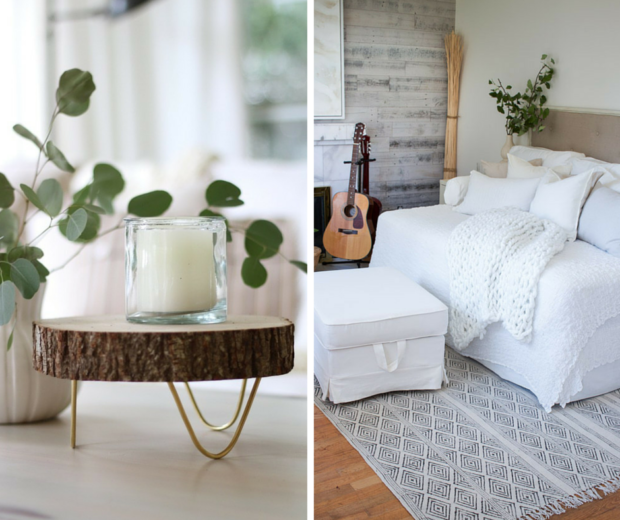 I really wanted this little space to feel dreamy, be functional, pretty and comfortable! Grandin Road made that easy with their exceptional pieces and the style of their selections. Furniture can be used in so many different ways and in varying formations. For example, I can move these sectional pieces around – making the size smaller, shorter or pulling a chair out to the corner. Or for example, the fire pit with a tray that can be used for carrying around food and then turned over for a coffee table surface later. I have even thought about bringing the dining table over to the sectional when I want to fit a larger party. I can’t say enough about this company, the quality and how wonderful they have been to work with! As summer approaches and school winds down, work becomes play and this space will be an extension of our home… I treasure the thought of meals and memories out here with loved ones, watching kiddos play and run through the sprinklers, books on breezy warm days and so much more. We won’t be taking a vacation anywhere exotic but sitting back and enjoying the comfort of home. There is no place I’d rather be. I hope you enjoyed this post as much as I did putting it together! And a huge thank you to Grandin Road for sponsoring this post – all opinions are 100% my own. 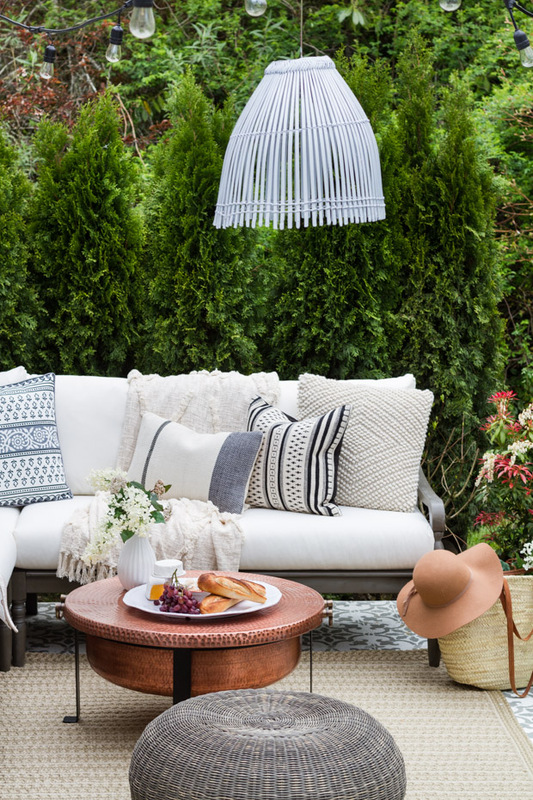 Love your patio. I have a covered patio and am wanting to do something with it this year. Tell me are those tiles you laid over concrete patio? I love the design. Where did you get them? 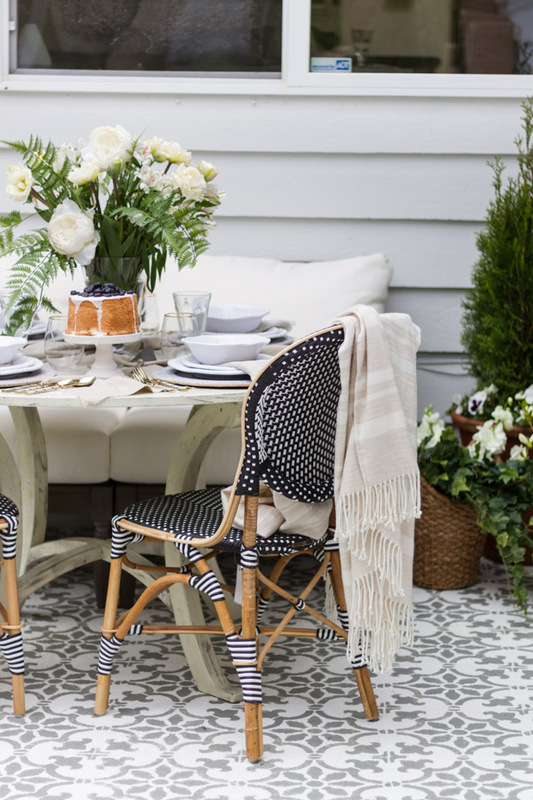 Your patio is soooo beautiful Congratulations on a job well done…now soak it all up! A most beautiful well designed patio that is perfect for your family. Love Grandin Road beautiful, quality products. May you enjoy many years in that wonderful patio making joyful memories with your family! Shirley that is so very thoughtful of you and means a lot. Thank you! Hope you have a wonderful rest of your week and please know how much I appreciate you taking the time to visit and encourage me! I am obsessed with every single detail Annie!!!! Soo perfect! This is so beautiful, Annie! And you succeeded. It is so inviting and looks so comfortable. Good job! Susan thank you! That makes me so happy you think so! I really appreciate that – thank you Susan! First, let me say how beautiful your humility and gratefulness are. 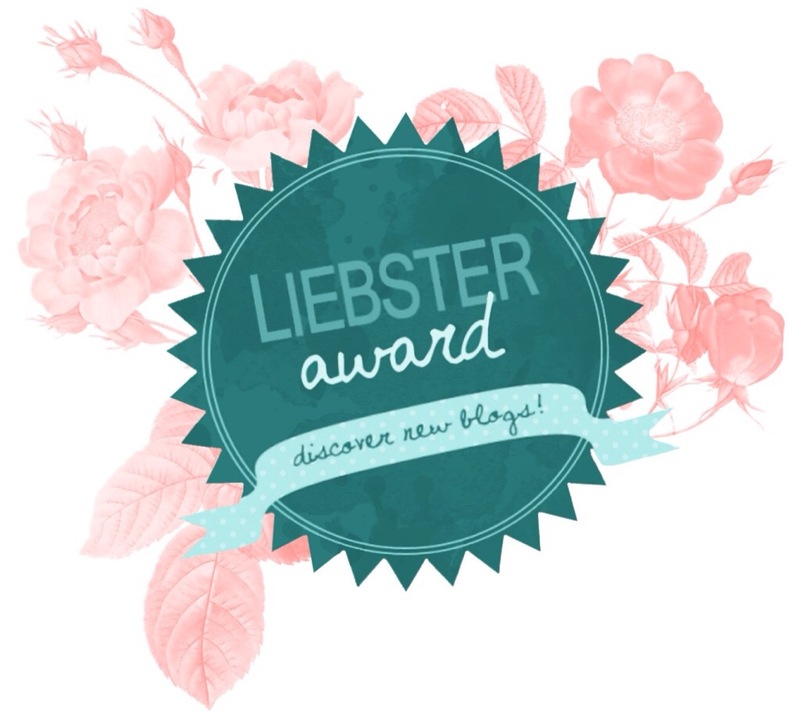 Your words about your family, home and blog touched me. Next, your patio is truly warm, inviting and beautiful. I can envision days and nights spent there enjoying precious moments with family and friends. Bravo–Grandin Road has beautiful products and you displayed them in the most stunning way!! Carol oh my goodness, your comment blesses my heart and so do you… thank you! You have been such a wonderful encouragement to me and I can’t tell you what that means. You are such a sweet heart and I am so happy you visited today – thank you friend. Beautiful! What a wonderful space to enjoy with your family and friends! Kathy thank you so much – we are so excited to spend more time out here! Oh my gosh! Stunning! Every detail is perfect Annie! What a transformation! Ash thank you so much I really appreciate that – xo! Yes we sure hope to make lots of them this summer and thank you very much Dianne! I appreciate you taking the time to visit! Absolute perfection! Love love love!!! 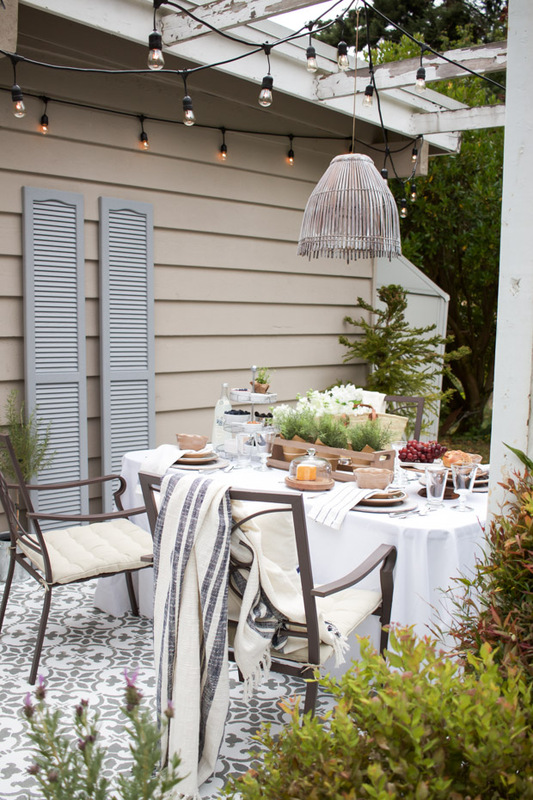 Would you be willing to share more details about how you covered your patio? I am looking to do something similar on our low deck with the hopes of being able to enjoy it more, even in the rain. Hi Brandi, thanks so much – we had it professionally done – but I will try to share some details soon! Thank you again! 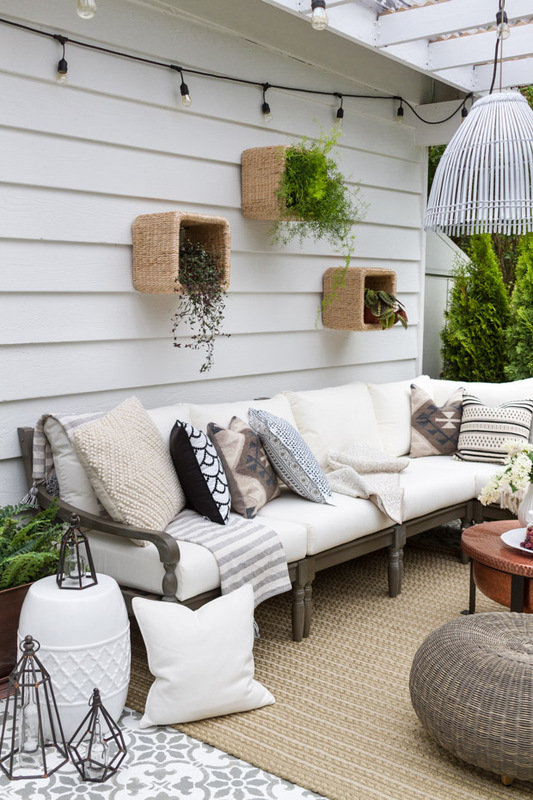 Love what you did with your patio! We also have a patio that needs some TLC…Was wondering what you used for the patio cover/roof?? All looks to cozy and inviting! Hi Connie, thank you very much! We used some plastic grooved panels – I will try to share some more details in a post soon as they have worked out wonderful so far! My very favorite outdoor seating area. 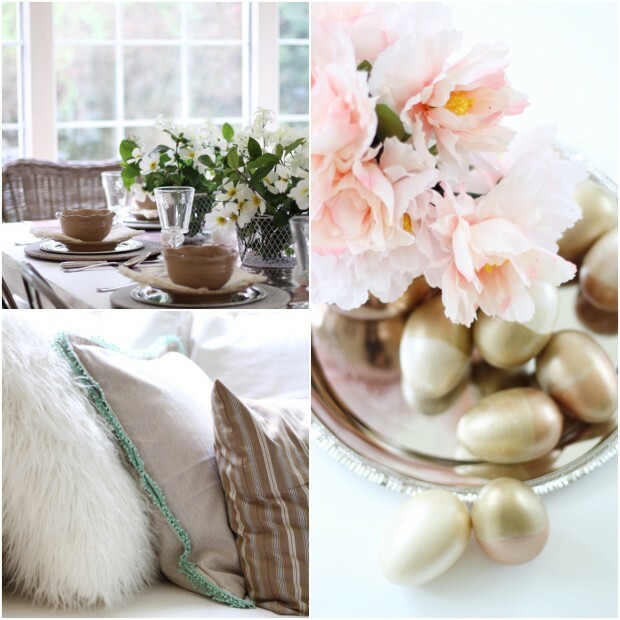 You have such a gift in making a home look cozy and oh so gorgeous!!! Is that vinyl siding? 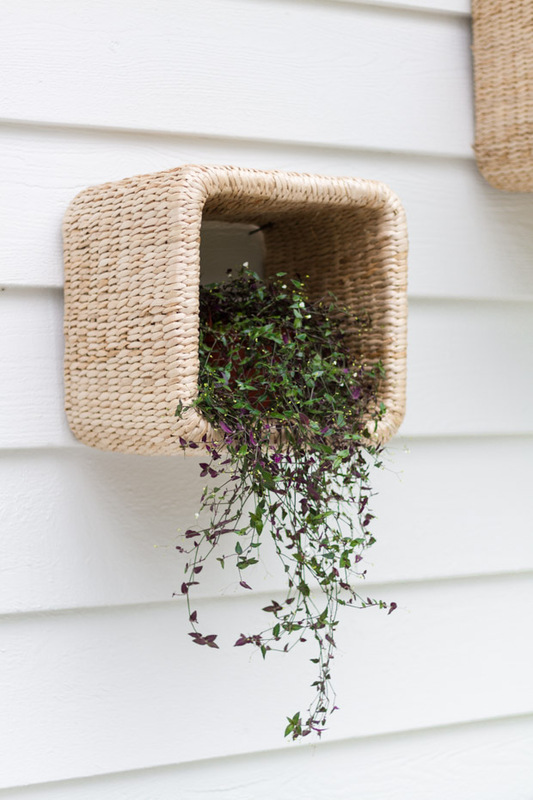 How did you hang your baskets on the siding? We have vinyl siding and I’m not sure how to do it. Oh Annie- this is so beautiful!!!!!! I love every single thing about it. You did an incredible job! I would love to know where you got the wicker shelves? This is stunning!! Great job!! Do you have a source for the wicker shelves? 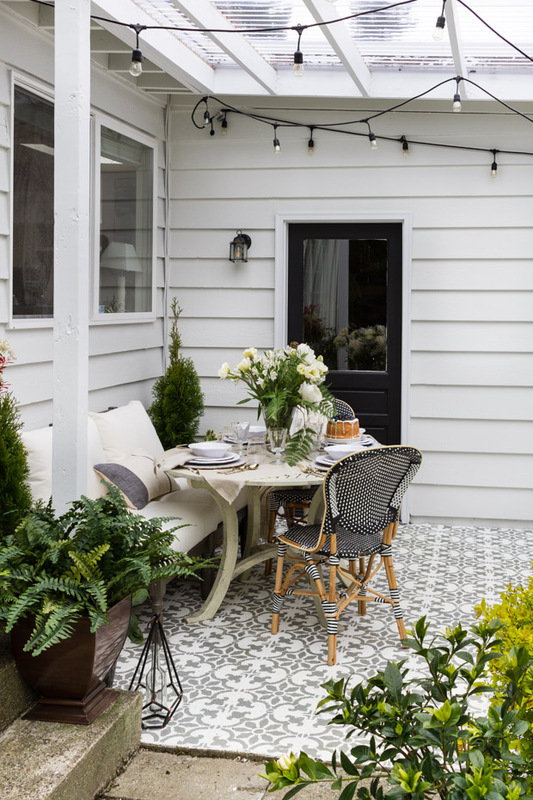 Love your patio, it turned out so pretty and so functional too. 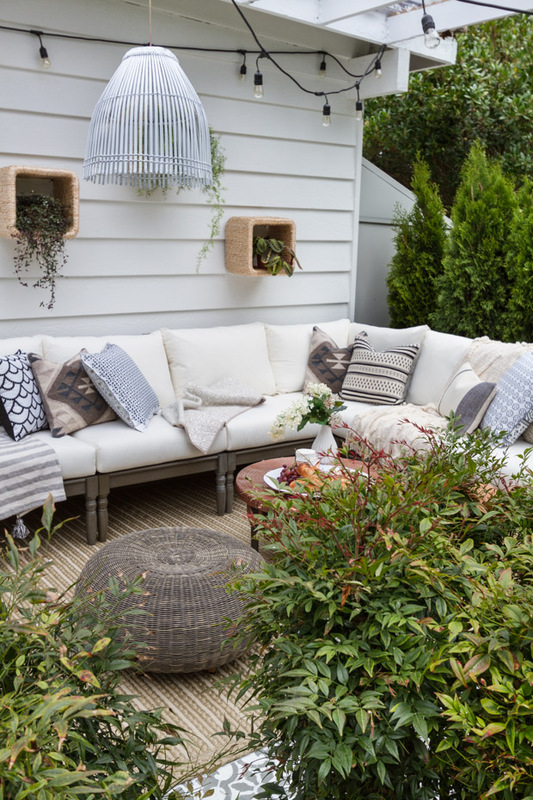 You did a great job of creating a very inviting and gorgeous outdoor room. Love it all. Annie this blows me away! Your heart is of gold and so is the touch of your hands. Way to go and enjoy that space! 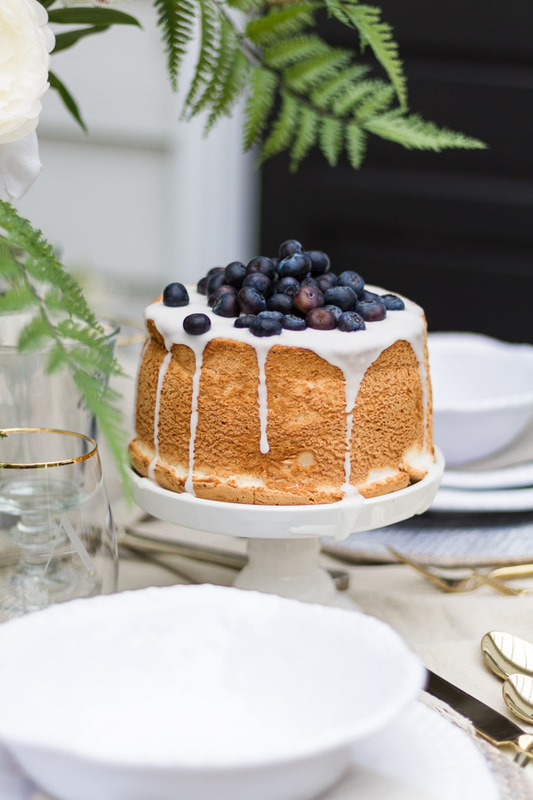 I came across this post on pinterest and am loving everything you did! I have 3 little ones under 5 and am wondering how that sectional has been with kiddos and cleaning it? And are your cushions in the Ivory color? I also love the chargers you used. Where did you purchase those? Thank you so much! This is so beautiful! Looking to get this same sectional on Grandinroad.com, but it looks like they only have gray cushions. What color cushions did you get? And did you get the ones specifically for this sectional? Thanks so much for your help and time! 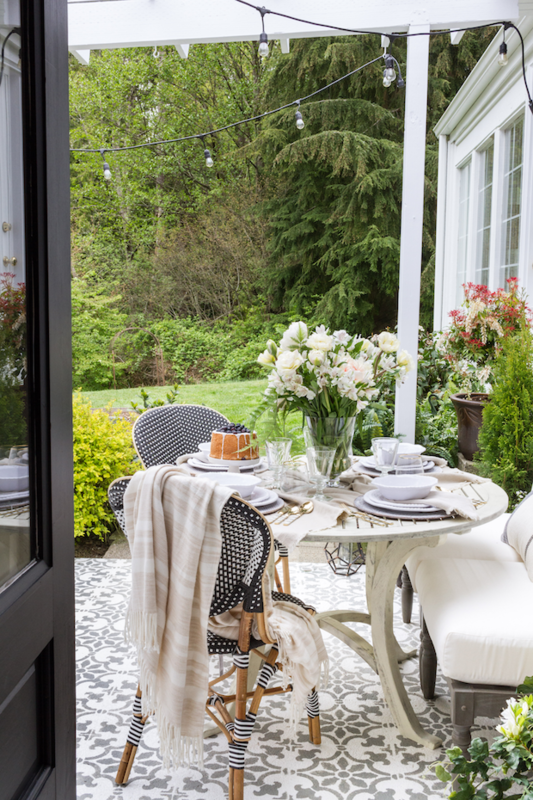 I love the pergola, but since it’s hard to see, what covering did you use above it to cover the porch? I would like to do a similar thing but fear taking away from the beauty of the pergola if I do. But yours looks beautiful! Hi Sandy, thank you so much. I understand that and we wondered the same thing! It actually isn’t as noticeable as I thought it would be and it is plastic roofing panels. They were so affordable and let the light shine in which is helpful as well. Thank you for stopping by! i love it all. it’s wonderful. we are just starting to get quotes from contractors. i have a question, your plastic roof panels…do you have rain gutters? is it loud when it rains? 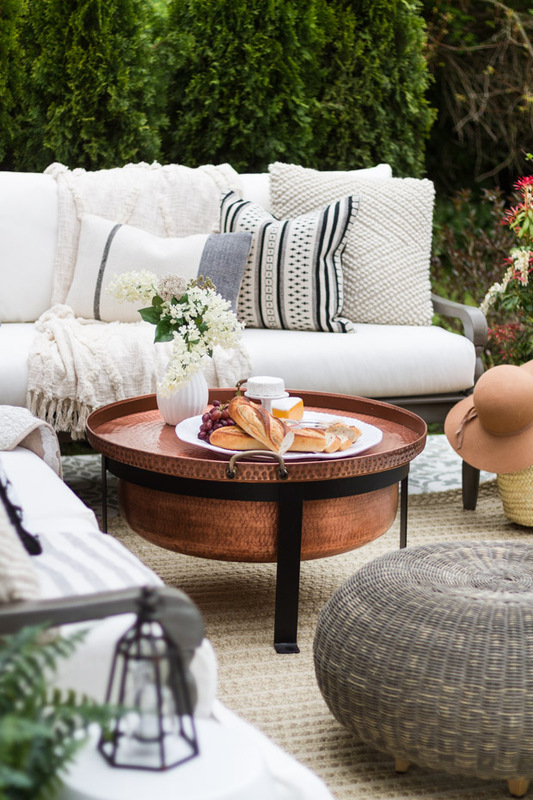 i am in love with the same look but with the galvanized/metal, just afraid of the noise when it rains and rain gutters…..
Where can I get he copper coffee table? I think that’s the most beautiful outdoor space i’ve ever seen!!!!! Thank you for sharing!!! Hello Annie, I just happened upon your post from Pinterest and enjoyed reading it so much as I design an outdoor living space for our family of six. Thank you for your lovely ideas. I especially appreciated your gratitude and obvious love of family. (Stenciling the concrete pad? Genius!). What a beautiful space! Would love to do something similar in my next baxk yard! 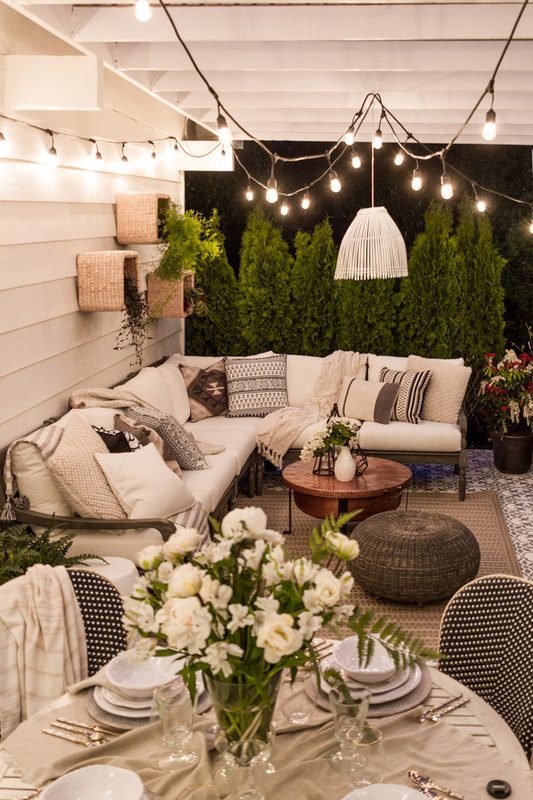 Such a beautiful patio and well put together..all the details matters. I just finished fixing up our front porch and to my delight, I am liking thus far. I wanted that get-together feeling so, I put a Harrison bar set from SEARS there, along with a bench with cushions, plants and little added details. 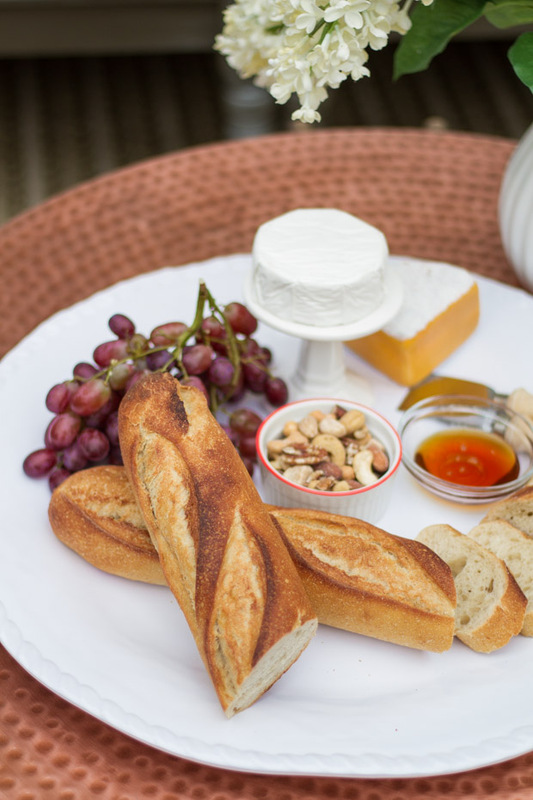 Now, my family and friends are enjoying our porch who at first, was a tad skeptical about the bar, but it works and they hardly want to leave the front porch – very cozy like your setting and get a chance to say hello and see to our neighbors more often. 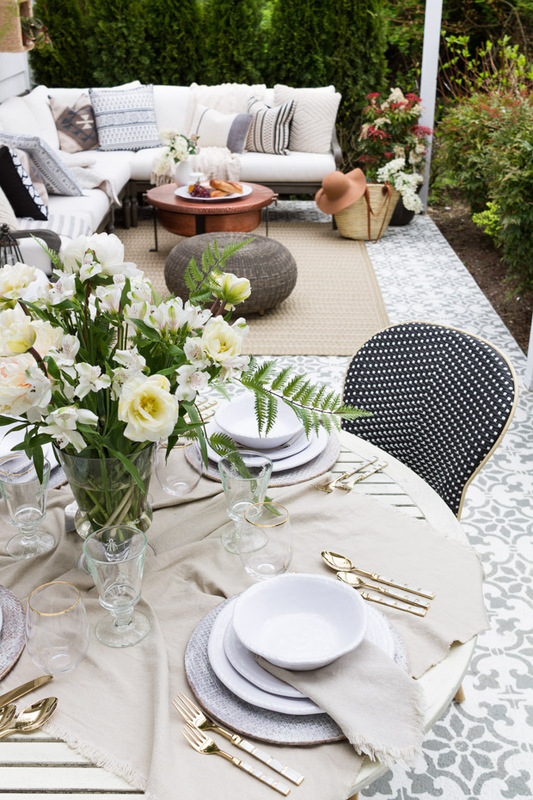 I am still in process of finding a nice outdoor rug for the space. 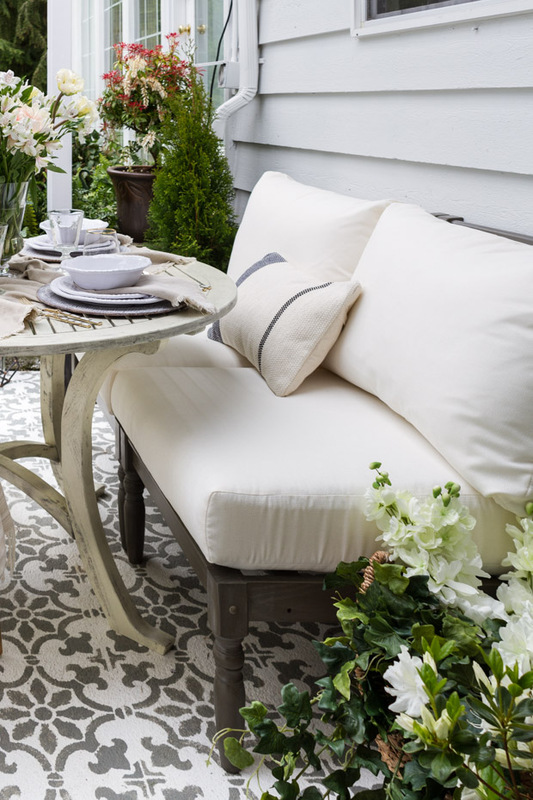 I anxious to know how you stenciled your patio? It is awesome!! Hey! I’m curious how well the sectional is holding up, looking at purchasing that for our patio. Let me know! 🙂 Beautiful blog post! Hey! I’m curious how well the sectional is holding up, looking at purchasing that for our patio. Did you purchase the ivory or sand cushions? Let me know! 🙂 Beautiful blog post! 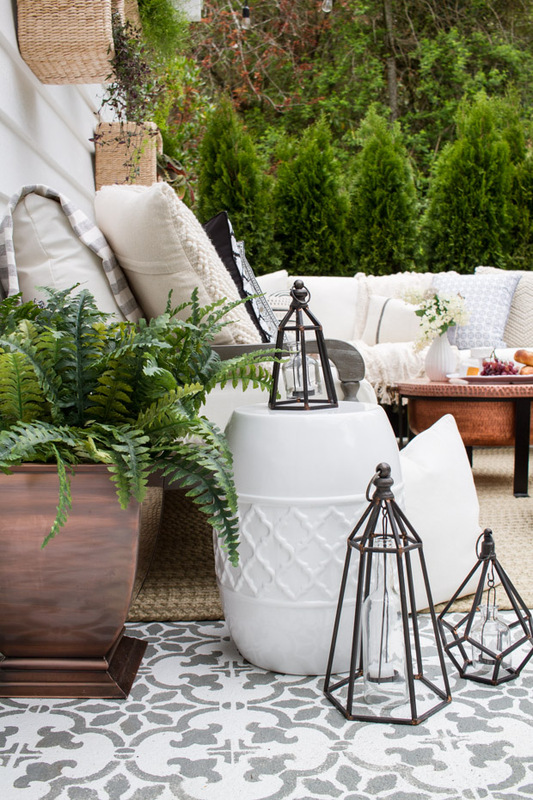 I really love the patio furniture and the decor and I’m thinking of purchasing the fire pit, rachel ottoman, and rug you have here. It all looks so beautiful together. I keep eyeing these photos and cannot get enough. There are two sizes of the Rachel Ottomon. Which size did you get for your patio? Thank you so much! Also, is what color is your Rachel Ottoman? That looks so great! I love the stencil concrete and your sectional. Love that you put where you can purchase a lot of the furnishings you used. Beautiful space! I’m wondering if you use the fire pit on the patio under the covering? Does it get too hot for the roofing panels and/or get smokey? Wow! What a beautiful space! I am curious how you covered your patio. We are looking to do something similar but it is so difficult to add on without it looking cheap, what you have done looks wonderful the perfect amount of country chic. Hi Jane, thank you so much! We hired someone to do it professionally, but we added plastic sheeting above the pergola and have loved it! I worried about the same things you said as well – but so far so good! Where did you get your wicker hanging baskets? 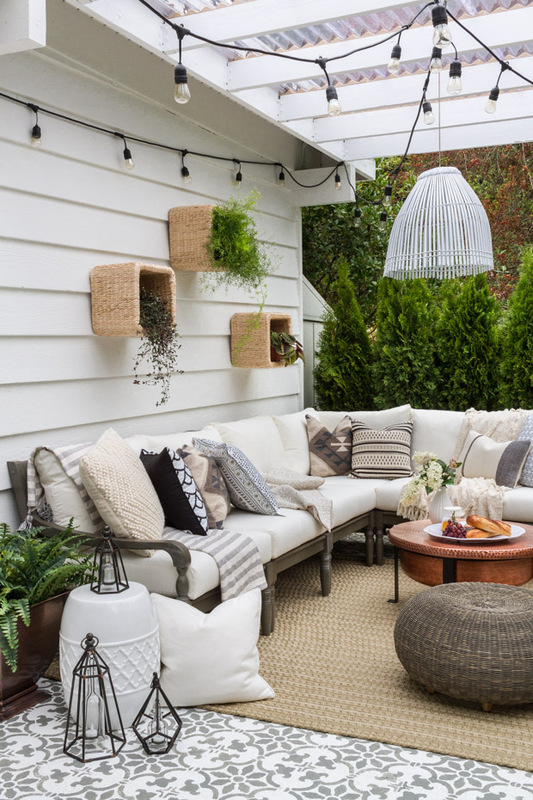 I would love to do this on my outdoor patio! Your space is so incredibly beautiful and inspiring! I’m an instructional designer and graphic artist so I spend my days arranging the right colors, photos, graphics and whatever else to be just so. I can tell you that when I came across your post and photos of your lovely patio all I could think is there is no way to improve on it. It is perfection. I was so inspired that I began to recreate it piece by piece. It may take a little while, and there will be some difference I’m sure, but if it’s half as lovely as yours I will be thrilled. Thanks for taking the time to share your journey! Hi there! Where did you get the wicker shelves from? Beautiful space! Hi. I really love your space. I’ve been looking at this sectional for a year now and am deciding this is what I want in my outdoor space. Can I ask how many pieces and which of the pieces you have here opposite the table, bench and chairs? Your space is absolutely beautiful and so cozy.